Samsung C24FG70: the Quantum Dot panel is a leap forward for gaming displays. Oh boy. Quantum Dot. There is no other term in screen tech – hell, probably in computing as a whole – that sounds quite as cool as Quantum Dot. Samsung have been coating their TVs in the nano-crystal stuff for years now, but this new gaming monitor is the first time we’ve seen it attached to our PCs. Read more: the best gaming monitors around right now. The goal of the Quantum Dot filter is to generate a wider colour gamut than traditional LCD panels, but that’s not the only reason this curved 1080p screen is being touted as a quality gaming monitor. 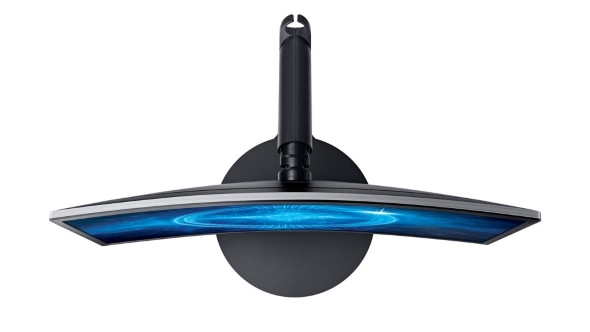 Samsung have put a lot into this $350 (£335) panel, so was it worth it? Click on the jump links below to leap to your section of choice. The big news about the CFG70 monitors is, of course, their Quantum Dot filter. The filter is designed to expand the breadth of colours the screen is able to display, offering 125% of the standard sRGB spectrum. When we’re talking about games, especially those with bright colour palettes, that added vibrancy should really make them shine. The filter sits between the actual LCD panel and the external screen covering. It’s that diffusing Quantum Dot layer which adds the extra colour spread to the light the monitor emits. Behind the filter Samsung are using a pretty standard vertical alignment (VA) panel to produce fast response times, high refresh rates and decent viewing angles. It also means they can keep the price a little lower than they might otherwise have to with a PLS/IPS display. 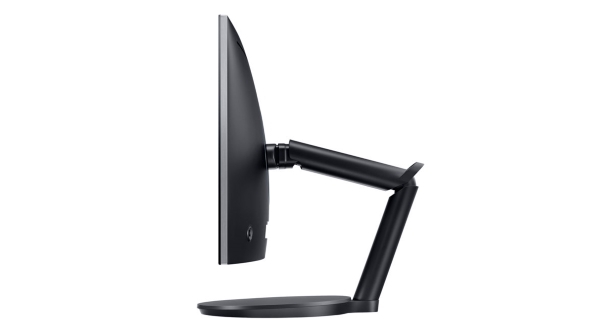 This 24-inch curved screen has a native 1080p resolution and supports the lightning-fast 1ms response time with a refresh rate that’s able to go up to 144Hz. With the adaptive sync (and therefore AMD FreeSync) support that means the Samsung is able to present a seriously smooth gaming experience even on relatively modest graphics hardware. The smart stand is also worth a mention thanks to its dual-hinge design which allows the screen to be easily shifted all over the place and adjusted to your heart’s content. It also means the panel can almost appear to be floating over your desk too, which is a nice aesthetic touch. 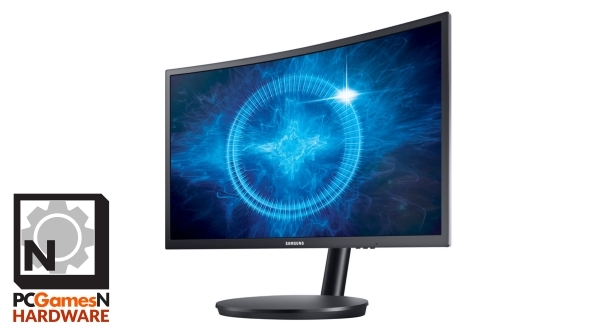 The first thing to grab you is the enhanced vibrancy of some of the colours displayed on the Samsung C24FG70 monitor. That Quantum Dot filter really does make a difference, pushing the VA panel past what such screen tech is normally capable of. It’s especially noticeable on this ‘ere fine PC gaming website – the PCGN orange really pops with them nano-crystals doing their colour filtering job. The Quantum Dot display really pushes reds and green tones especially far, making them stand out far more than the modern AH-IPS screen I’ve got it sat cheek-by-jowl with. Interestingly though the panel isn’t able to do the same for blues, which seem slightly muted by comparison. Aside from the clear, distinct colours the wider colour gamut also helps lead to improved contrast. Combined with the 3000:1 contrast ratio of the Samsung panel the extended colour reproduction stemming from the Quantum Dot filter adds greater depth as much to darker scenes as to lighter ones. That works well for the brightly lit, but shadow-laden, pitches of FIFA 17 and the vivd Blood and Wine expansion for Witcher 3. The vibrant Toussaint countryside and the colourful courtiers of the chivalric world burst out of the screen, but the visuals remain just as crisp and detailed in the darkest depths of the many-layered story. Obviously if you want good contrast you need excellent black level performance and the Quantum Dot panel stands up brilliant both with the fifty shades of black as well as the white saturation levels too. There’s zero banding in any of the gradients either, with the display able to offer images smoothly transitioning through different shades on-screen. Sat next to a quality, modern AH-IPS display the whites do look a touch yellow in comparison, but that is only something you’d notice in a multi-display setup. But it’s not a perfect panel. Oddly, for a VA display, the viewing angles aren’t that great; they’re not TN bad, but there is a distinct colour shift when you check out the screen off axis. That could be down to the 1800R curvature of the monitor, though at least the panel cover isn’t super glossy so I never had to suffer any weird reflective artifacts because of said curve. There’s also a noticeable difference in the corners of the screen too when you’re sat directly in front of it. There is a definite darkening at the extreme edges of the panel. Though it’s only really obvious when there are large blocks of single colours stretching into the corners it’s still not what we’d ideally want from a top-end monitor panel. 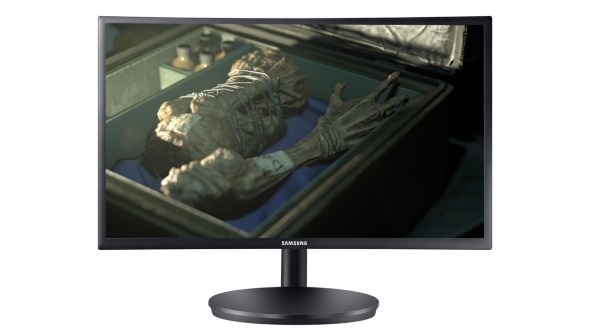 I do have some reservations with the monitor’s curve (to my mind there’s zero benefit in having a 24-inch, 16:9 curved screen) and the strange discolouration around the edges of the panel, but overall the Samsung C24FG70 makes for an excellent 1080p gaming monitor. It handles both the brightest and darkest imagery of PC gaming with equal aplomb, offering a colour depth you just don’t get from many other screens. That wider colour gamut isn’t going to deliver you a world of HDR gaming in the future, however, you’ll still need a specially set up HDR-ready display for that, as well as a host of other technical hoops to jump through. There is no proper HDR content in gaming as yet though, so it’s not like you’re missing out right now. The combination of 144Hz refresh rate and 1ms response time, with the added bonus of FreeSync compatibility, makes the Samsung a super smooth gaming screen, if a little on the low-res side. That 1920 x 1080 native resolution does mean you don’t need high-end hardware to nail the frame rates FreeSync works best at, but does mean it’s not going to make the most of your GPU if you’ve opted for a powerful graphics card. Even the more expensive 27-inch version still uses a 1080p panel. But it is surprisingly well-priced compared with some of the other 24-inch gaming-centric displays I’ve seen recently. $350 is a lot for a regular 1080p monitor, but considering the 180Hz ROG PG248Q is over $400 for a dull TN panel, that’s pretty good when you see the comparative image quality you’re getting. The 24-inch Quantum Dot Samsung is a bright, slick, detailed screen, with only a few slight niggles surrounding the curve and the low-rent resolution. For a mid-range gaming PC the C24FG70 would make for a great little display.